It is easy to fall into a pattern or style of illustration. To break the monotony, or creative block I occasionally like to apply an exercise I learned in Art School. 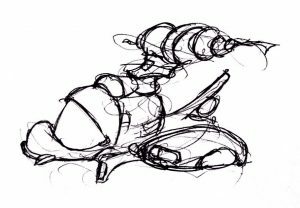 The fact is, with a slight application of imagination, even a scribble can look like a face. Therefore scribble on a page, and find the face. I figured this would work for spacecraft as well. This illustration is named AXLE. 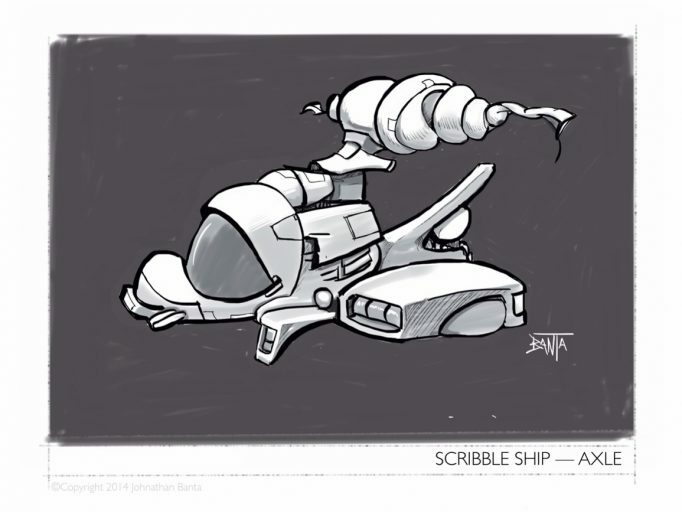 It is the first scribble ship to be presented in the #AGsketchbook, but will not be the last. I like it because it has a James Christensen fanciful aesthetic to it that I usually reserve for cartoons, and not technical craft. Thus it is a lot more interesting. It is another sketch I could not leave in a raw form. During the inking phase I tried to limit myself to methods I had before computers. No undo, but layers, markers, and graphic white. I have to say that was not wholly possible, but reminds you of the advantages you have today with computers.